Don’t panic, this isn’t about me.. 😉 No agencies please! We are looking for a dynamic leader with excellent IT knowledge to lead and manage our High Performance Computing (HPC) team based at VPAC (housed at RMIT University in Carlton). Your ideal background would include management of similar teams and the provision of strong hands-on experience, coupled with full responsibility for technical infrastructure. The Operations Manager will build and maintain strategic relationships with key stakeholders such as Victorian Universities and national initiatives such as ARCS, NCI and ANDS. Reporting to the Chief Executive Officer you will be a key member of the VPAC Management Team and lead a growing team of around 15 Systems Administrators and Developers. As VPAC is aiming for industry best practice and holds ISO accreditation it will be expected that you will have worked in similar environments that provide a process based approach to IT service management. There is also a copy of the PD on the VPAC employment positions web page. As ever please contact VPAC recruitment, not me, about this position..
Well thanks to those nice people at Rimuhosting for migrating this Xen host to a 2.6.27.x kernel and pointing my at the Hurricane Electric IPv6 TunnelBroker.net service this blog is now IPv6 enabled (as is Donna’s site, blog and podcast)! Slowly updating DNS for all the other sites hosted here but I’ll finish that off tomorrow night. The fact that the Apollo programme ended so soon after Apollo 11 (Apollo 17 was the last mission, and the only one to carry a scientist, geologist Harrison Schmitt) was already foreshadowed in budget cuts in 1967, which to me seems a great shame given the fact that we were for the first time looking at leaving the cradle of the earth – something that humanity will have to do eventually before the sun dies (assuming we can survive the current issues facing us). I wonder what we would have found on the lunar surface if further Apollo missions had taken more scientists to the moon ? Would we have already explored the craters nearer the poles where we now look for water ice ? Would we have have a permanent base there ? Few people know that NASA had already planned, prior to Armstrong, Aldrin and Collins, longer stays, a lunar flyer to let astronauts visit other areas on the surface and even a base on the moon as part of the Apollo Applications Program, though sadly only Skylab survived the axe to make it into space. 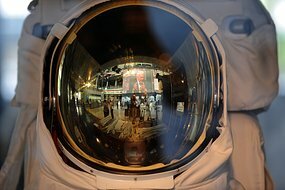 After Apollo 17 it took another 6 years for NASA to get back into space with STS-1, the first shuttle space flight, and we’ve still not been out of earth orbit since 1972, 37 years ago. It would be tragic if we ended up like the original settlers of Easter Island who used up all the resources needed for long distance travel and effectively stranded themselves. Various analysts and sites have recently confirmed a vulnerability is present in FireFox 3.5.1 that has had exploit PoC released. When exploited, the vulnerability can lead to system compromise or induce a DOS. No Patch is available. Interestingly the SecurityFocus BID for this says it’s FF 3.5, but the ISC SANS post above does say 3.5.1 (and they do know what they’re talking about). There is also a CVE number allocated to it, but I’m having problems reaching that at present to check what it says. One possible explanation is that Mozilla pushed out 3.5.1 to fix the 3.5 0day that appeared recently, but this bug was found beforehand and Mozilla weren’t aware of it prior to releasing 3.5.1 (or they thought it was more important to get the other fix out whilst they worked on this). 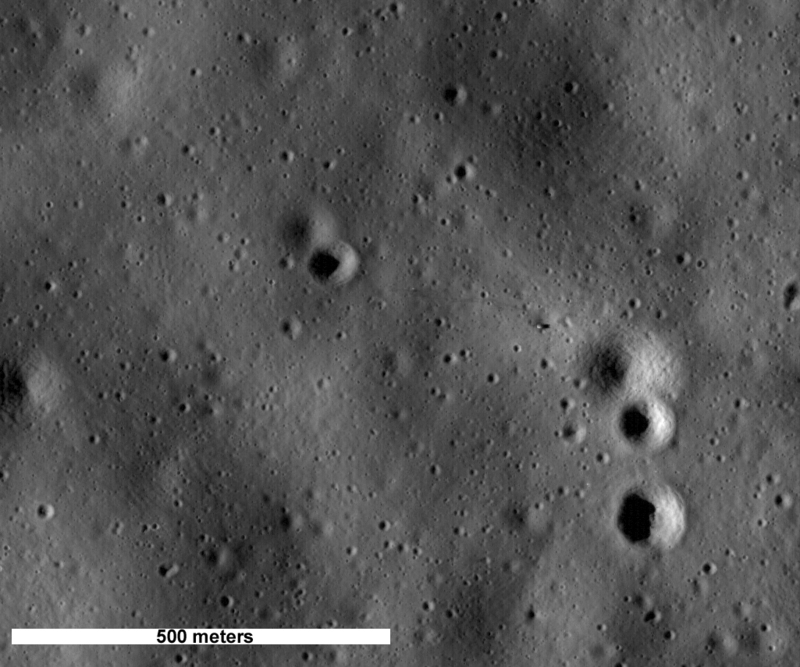 NASA’s Lunar Reconnaissance Orbiter (LRO) has returned some initial images from a number of the Apollo landing sites on the moons surface, namely Apollo 11, 14, 15, 16 & 17. 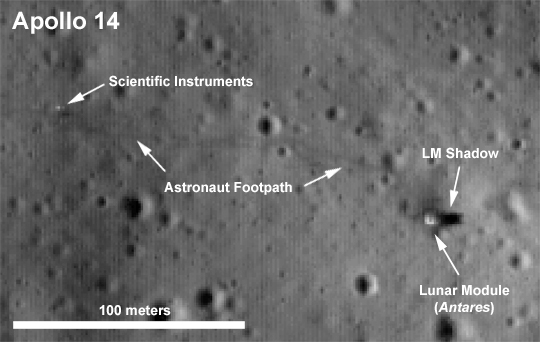 My favourite has to be the Apollo 14 image which includes the trails of the astronauts footprints from the LM to a set of scientific instruments. In case you can’t spot the details, here’s the annotated image. Don’t forget these images were taken during the commissioning phase of LRO whilst it is in a highly elliptical orbit, NASA believe that once its in its science orbit (roughly 50 miles altitude above the lunar service) the resolution will by around four times greater! NASA are soliciting for peoples names to go to Mars on the Mars Science Laboratory (MSL) rover called “Curiosity“. I’ve just added mine, go and add yours! Just got back from a talk Donna was doing to find that the BoM has issued a tsunami warning for Victoria after a large earthquake near New Zealand. An undersea earthquake of magnitude 7.9 has occurred at 07:22 PM EST on Wednesday 15 July 2009 at 45.960S , 166.470E off W. COAST OF S. ISLAND, N.Z. Sea level observations have confirmed a tsunami has been generated. The weather bureau says there is a potential tsunami threat to New South Wales, Tasmania, Victoria, Norfolk Island and Lord Howe Island. No risk to us, being well inland, but hopefully those nearer the coast will be OK.
774melbourne Correction: TV NZ reports the NZ wave was around 17cm. 774melbourne Observations of a very small Tsunami in Tas. No major land impact expected.